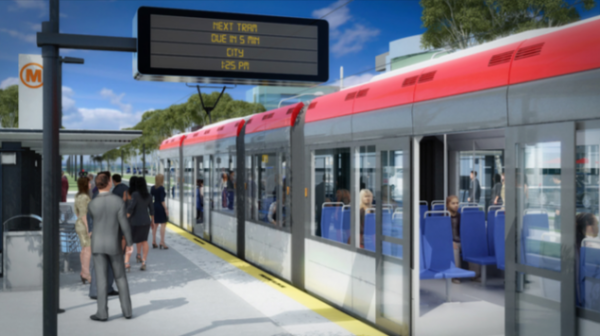 The next stage of light rail should take in City West and pass through Parkes and Barton on its way to Woden, according to the results of the community consultation process conducted between 1 May and 11 June. The consultation report said that there was strong support for this route so that Light Rail Stage 2 could capitalise on education and employment hubs, and proximity to cultural institutions and events by Lake Burley Griffin. Minister for Transport and City Services, Meegan Fitzharris said that the Your Say online survey drew 4,772 responses on preferred route options, alignment and stops. “The report indicates that 75 per cent of respondents support a route that travels through Parkes and Barton,” she said. Many respondents thought there should be additional stops in Barton to service employment hubs and provide better access to Manuka Oval and shopping precincts. Ms Fitzharris said respondents also believed this route would serve a large number of commuters and allow for future stages to continue on to Fyshwick and Queanbeyan. The report said there was support for light rail to continue to the Canberra Hospital but doubts were raised about how convenient it would be to the hospital entrance and the implications for the future southern extensions of the network. “Further investigation of the possible route to the Canberra Hospital has identified potential technical constraints to the future southern expansion of the network and potential operational and hospital access issues,” it said. It said a range of additional alternative routes were suggested including traveling along Melbourne Avenue or King Edward Terrace, through Deakin, and extending to Mawson. The consultation found alignment selection should be based on the location of the stop, route and likely access for pedestrians, with safety paramount. Respondents also believed additional pedestrian infrastructure was important in the event of median alignment along busy roads such as Adelaide Avenue. The report said there was concern about how visual amenity and heritage sites along the proposed route would be managed. Commuters also want to know more about how light rail will integrate with other transport modes and contribute to other key urban renewal projects, and want further consultation on these issues. Ms Fitzharris said that there would be more opportunities for Canberrans to have their say on broader issues identified along the southern corridor while the Government developed the Stage 2 business case later in the year or early 2018. The consultation reached 4,772 people via Your Say ACT, sent emails to over 150 organisations and schools, visited businesses and shopping centres throughout Canberra and distributed over 2,990 brochures and newsletters. It delivered eight presentations to 199 people, received 1,796 items of written feedback, spoke to 587 individuals and reached a social media audience of almost 40,000. A major problem with the light rail to Woden will be the doubling of journey time compared with the current buses (12 minutes) using their own dedicated lane (calculated using the average operating speed claimed for Stage 1). Diverting the route through Forrest, Barton and Parkes will likely make it three times as long. With only half the percentage of seats of buses, many passengers will be strap-hanging unless elderly or disabled. The secret “technical constraints” obviously make a mockery of the government’s claims of transparency and consultation. You are making an assumption that light rail is replacing the buses which run essentially express from Woden to the City (yeah a couple of stops) as opposed to light rail being an addition that services the corridor it runs through. The government hasn’t actually announced what it will be. Well, the assumption is well founded given that TCCS are withdrawing the ACTION express busses from Gungahlin to be replaced by the (slower) trams on Stage 1. What express buses are these Dungers? Might surprise you but except for route 202 all buses from gungahlin to the City are stopping services not express. And there are only about 3 or 4 202’s each way in the peaks. And from what I hear the 25x services from the deep burbs of Gungahlin in the peaks will be changed into express buses similar to what services Tuggeranong and Gungahlin by re routing this avoiding Flemington Road and Northborne Ave. Think Gungahlin drive. With light rail servicing the corridor which it is designed to do and as the inter town route during the odd peaks. As I said about 4 a day each way that are express. The other 20+ buses each day down that road (200, 25x etc), the ones many say are being replaced by 12 light rail services are all stops anyway. The Red Rapid 200 series limited stop service connects Gungahlin and City then Russell, Barton, Kingston and Fyshwick with busses departing every 15 minutes from 7am to 7pm and more frequently in peak times. Busses currently stop near Lysaght Street in Mitchell. None of the trams are stopping anywhere in Mitchell to service passengers. On ABC 666 Radio this morning, the announcer was constantly reminding listeners of “the mess” outside the studios on the corner of Northbourne and Macarthur Avenues and the traffic chaos that was ensuing because no right turns could be made and through traffic across Northbourne was blocked. He failed to mention what the cause was and I suspect he knew but wasn’t saying. It’s a good primer on what will probably be a permanent thing when the strap-hangers start rumbling through. And from what I hear the 25x services from the deep burbs of Gungahlin in the peaks will be changed into express buses similar to what services Tuggeranong and Gungahlin by re routing this avoiding Flemington Road and Northborne Ave. Think Gungahlin drive. .
Express via the “Gridlocked Drivers Everyday”? Unless one lane is made solely for buses, fat chance of ever becoming “express”. Who thought of this crazy notion? The same visionaries who brought us the arboretum, A Better Place, pop-up culture, and of late, the not-needed tram network. Well, that would be pretty interesting if they chose not to use it to replace the buses. They would then have a multi-billion dollar light rail system running parallel to the fraction of a cost buses so we could compare functionality. Nah, even I don’t think they’re stupid enough to attempt that. Parallel but with a completely different function which is to service what is along the route. And Woden to the city is a perfect example. The current bus route is pure express with a quick run time. Light rail would be fine along this route as express provided it was feed from elsewhere with stopping then express to the City. But this is not what is being proposed here. If you’re correct, it makes the whole idea of light rail here pointless, when you could service the areas quicker for a fraction of the cost with already existing buses. Why on earth would you waste a couple of billion dollars? The only way it would ever make sense is to replace the buses creating another leg of a north south transport spine. Of course the underlying premise is urban infill, it’s been the stated policy strategy for many years and the government keeps getting elected so the public in general must be extremely happy with it right? It certainly isn’t better transport, but it may not be urban infill either, given the recent budget’s $30,000-per-unit development tax. Or was that tax motivated by a desire to restrict infill seen as competing with those of the big-boys – the developers benefiting from the great Northbourne selloff? The tram was a smokescreen to distract from the real privatisation agenda: moving low-income residents way out of sight, selling-off public land along Northbourne for a one-off budget boost, and and helping property developers construct high-rise. The stage 2 route is trickier – with few privatisation windfalls, there is less incentive to prosecute an argument that slower and less flexible transport will revitalise Woden. The politicians in the ACT Government may have temporarily swallowed their own rhetoric on the tram, but with the electric and autonomous transport revolution dooming fixed-route and high cost transport, it is dawning on their bean-counters that the tram project will have to be cancelled after either Stage 1 or Stage 2, but sunk costs and pride play havoc with even the most rational decision-makers. There’s less privatisation available along stage 2 (which is why there’s even less chance of it being financially viable than stage 1), but the urban infill reasoning is the one they’re sticking with so it is what it is. 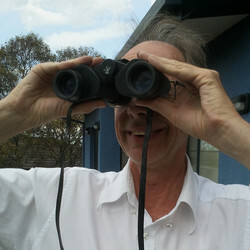 There’s still enough scope available for significant development. Just like stage 1, they will look to actually create a transport problem and then “fix” it with a light rail “solution”. We don’t have a transport issue we do have housing issues which need fixing which then need transport solutions that are not more of the same. The tram should be routed past the Mint…just to remind everyone that this exercise is costing a mint! Just shows why you shouldn’t really ask the public about a transport planning project. Any value that the light rail as a mass transport project is gone if they go through Parkes And Barton instead of continuing the main spine along Adelaide Avenue. Parkes/Barton should be serviced by a spur line or buses. 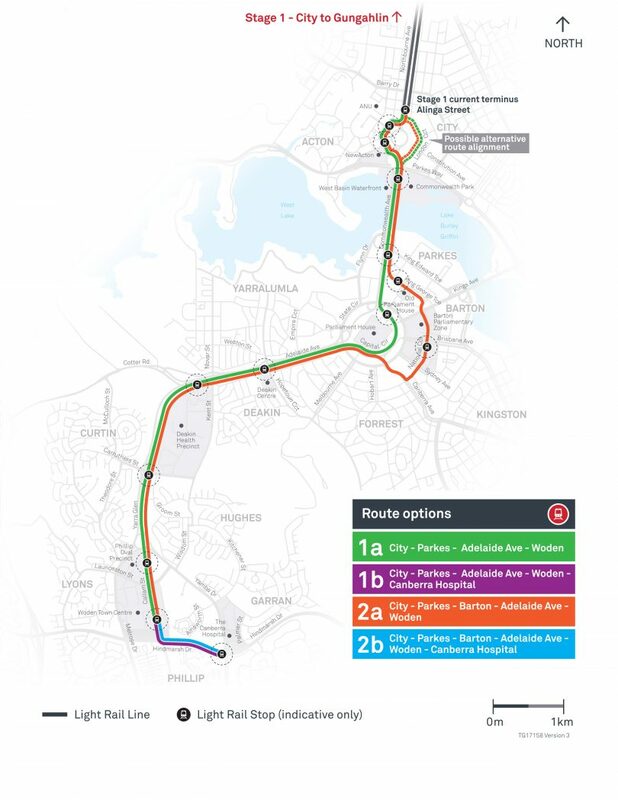 The light rail is already going to be significantly slower than current Woden/Civic express buses, this route would make it far less valuable to commuters overall. The light rail has nothing to do with public transport – it’s only about “urban regeneration” – this is the official policy position of TCCS..
Public transport through ACTION busses already services the “preferred” route in the same way as they do currently on the Gungahlin to City bus routes. Nothing will “improve” on the existing express bus service from Woden to City. There is no need for either improved public transport or urban regeneration anywhere in Canberra . The never was and there never will be. If our planners and leaders are serious about keeping thousands of cars off the road they should solely focus on developing rail access from Bungendore and Queanbeyan where the infrastructure and corridor already exists. Instead, they will probably convert that to a bicycle path when they close the railway station at KIngston. There’s no “need” to do anything, but given their stated policy on urban infill, it is a good thing to look at better transport because the policy will actively make transport harder and longer over time. Your argument that we don’t need to do anything because you like Canberra the way it is simply ignores the fact that clearly the majority of Canberra disagrees with you because they don’t support political parties who are proposing leaving Canberra the way it is. Well, that majority is mainly the 300,000 Canberrans who drive motor vehicles so until they all start agreeing with you I think they are happy with the way things are. 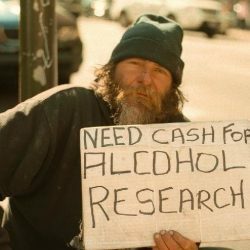 Agree with me about what? I’m against the light rail project. But you cannot deny the fact that urban infill has been the government’s strategy for years and they have won multiple elections since. If the majority think things are great as they are, why do they keep voting for the opposite? Moving through the pages I come to page 6 and an article about the light rail project titled “Tests on track to prevent stray tram zaps” (a scary and costly problem) and the cost of the project is stated to be $939 million. The cost of the contract discounted at a rate 7.52% pa on future payments was estimated at $939m in the summary released by the Government [ https://www.tccs.act.gov.au/__data/assets/pdf_file/0007/887686/Light-rail-Capital-Metro-Project-Contract-Summary.pdf ] But of course, future payments will be made from future revenue and so a fair estimate in current dollars is to deflate by the expected rate of inflation (probably at the lower end of the RBA’s target 2-3% pa). Also, that discounted figure is the contract cost, not the project cost, which requires major expenditure on the Dickson interchange (land purchase, road works), the park n’ drives, numerous associated works, project initiation (all that work performed pre contract signing) and ongoing contract management. In current dollars, the Stage 1 project cost is most likely around $1.4billion.